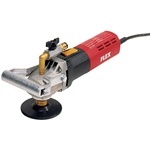 Here at StoneTooling.com, we carry a large selection of wet stone polishers, air polishers, and sanders by trusted manufacturers including Makita, Flex, and Alpha. These power tools are staples on the jobsite and in the shop for tile contractors, professional shop workers, and fabricators / installers of marble, granite, engineered stone and other materials. These hand-held, motor driven power tools are available as electric powered and as high performance pneumatic powered. For greater control, some polishers are available with variable speed control, making them ideal for use on sensitive materials. For additional grinding and smoothing of surfaces including wood, plastic, and metal, we have a selection of sanders available. We carry 5” and 7” sanders with variable speed control available on some, making them the perfect addition for the contractor and the DIY enthusiast. The Makita 7" Disk Sander GV7000C includes a 7.9 Amp motor which delivers variable speed of 2500-4700 RPM. It is lightweight for easy control. Sale price good through 4/30. This Alpha Air Polisher 658 is a high performance, pneumatic polishing tool designed for continuous production use. Alpha has replaced the VSP-120 with the newly designed Alpha VSP-320 Variable Speed Wet Polisher with 700 - 2500 RPM. The Flex LW603VR is the most cost-effective and sophisticated WET polisher. Its infinitely adjustable polishing speeds make this product ideal for very sensitive materials and offers you maximum flexibility. Flex Polisher Grinder LW1503 is the most popular wet polisher in the industry. The G13VA 5" 13-Amp Variable Speed Angle Grinder combines the power and performance with safety and convenience. The Makita 7" Disc Sander 9218SB is lightweight for less fatigue while its powerful 5.2 AMP motor operates at 4,000 RPM for smooth sanding. The Makita Sander Polisher 9237CX3 is great for fast & powerful polishing for clear coat finishes. This Makita PW5001C 4" Electronic Wet Stone Polisher is precision engineered for a professional finish every time it makes contact with granite, marble, limestone and more. This sander/polisher comes equipped with an electronic speed control that is designed to maintain the desired speed when the tool is under load.